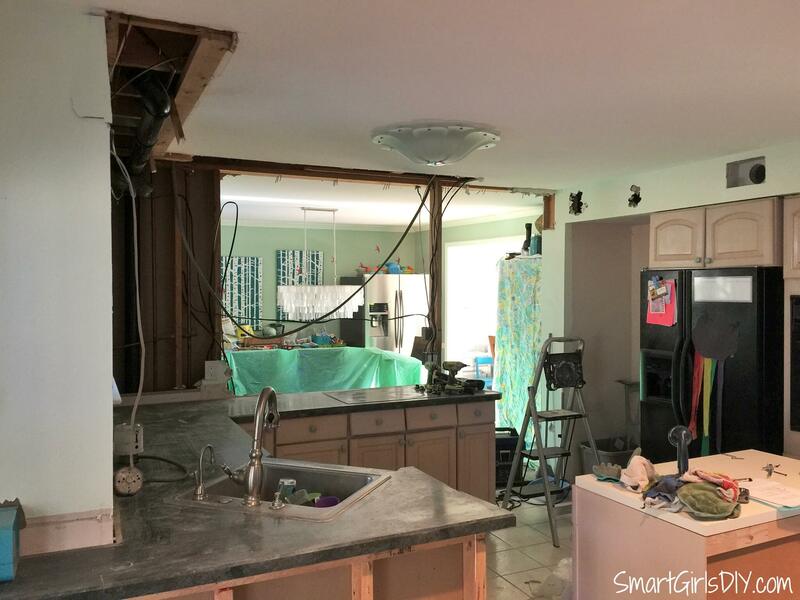 You may already know that I tore my kitchen apart this weekend. No? Well then you should be following me on Facebook or Instagram then. So far I’ll I’ve accomplished is the kitchen demo, I’m still trying to figure out an overall plan. But I wanted to share with you what I’ve done so far, otherwise I’ll probably forget all the details. A little background — we’ve lived in this house for almost 6 years. 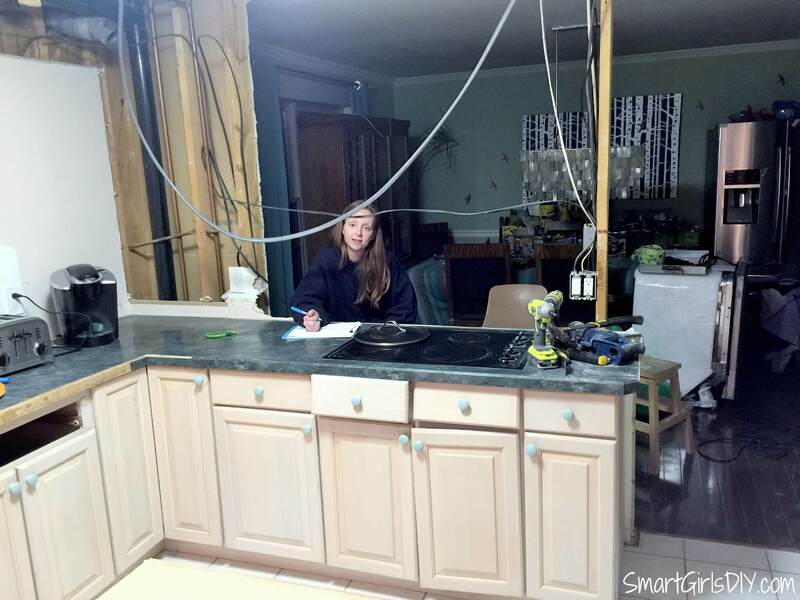 We renovated the kitchen in our last house right before we moved, so we were burnt out on kitchen remodeling at the time. Most of the things that bothered me about this kitchen have done so since day 1. So I’ve been compiling a list of things I’d change for quite a while. white tile! I mean really!? 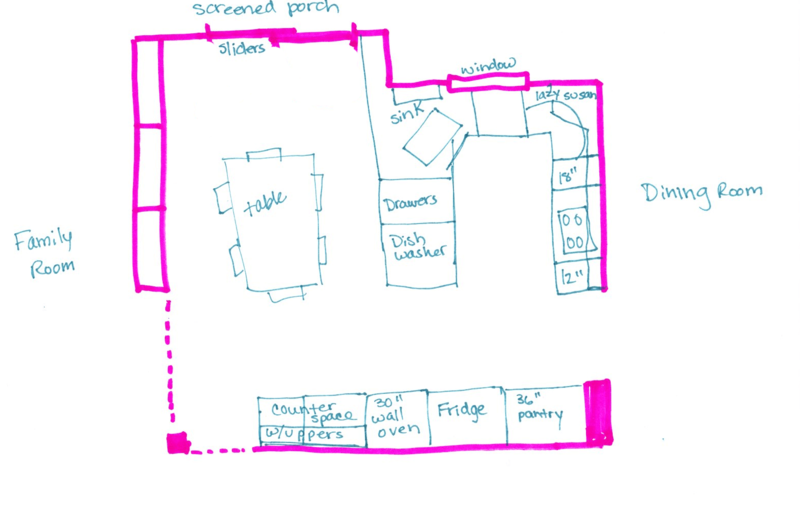 This was the kitchen layout two weeks ago. I wanted to get a better feel for the layout before I went further with the design. And so began the demo… while hubby was out of the country. Of course. 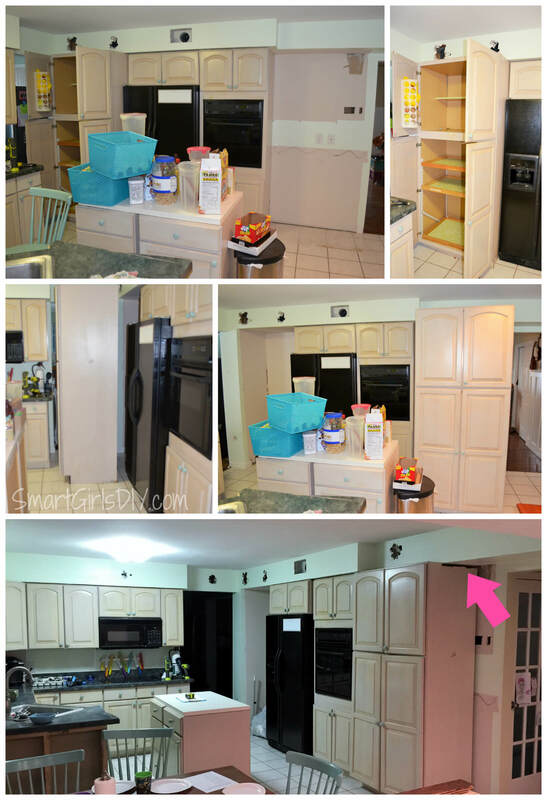 First thing to go – the upper and lower cabinets when you first enter the kitchen. The counter top and broken cabinet made it to the curb just in time for bulk trash. I am going to reuse the upper cabinets in the shed, which has nothing in the way of storage right now. To get rid of the peninsula I tore off the back panel, then used a circular saw to cut off the counter top. Hubby had removed the old dishwasher before he left. He thought we were going to install the new one. Lol. He can’t install it because there’s no more peninsula. That base cabinet is now part of a makeshift island. I’m planning to have a tall pantry cabinet to the right of the wall oven, so I wanted to make sure I could handle having something so obtrusive there. The best way to find out was to move my existing piece of crap pantry cabinet over there. I had to use my reciprocating saw to take a bit off the top to get it to slide in, but no worries, the kids just paused the Netflix until I was finished. 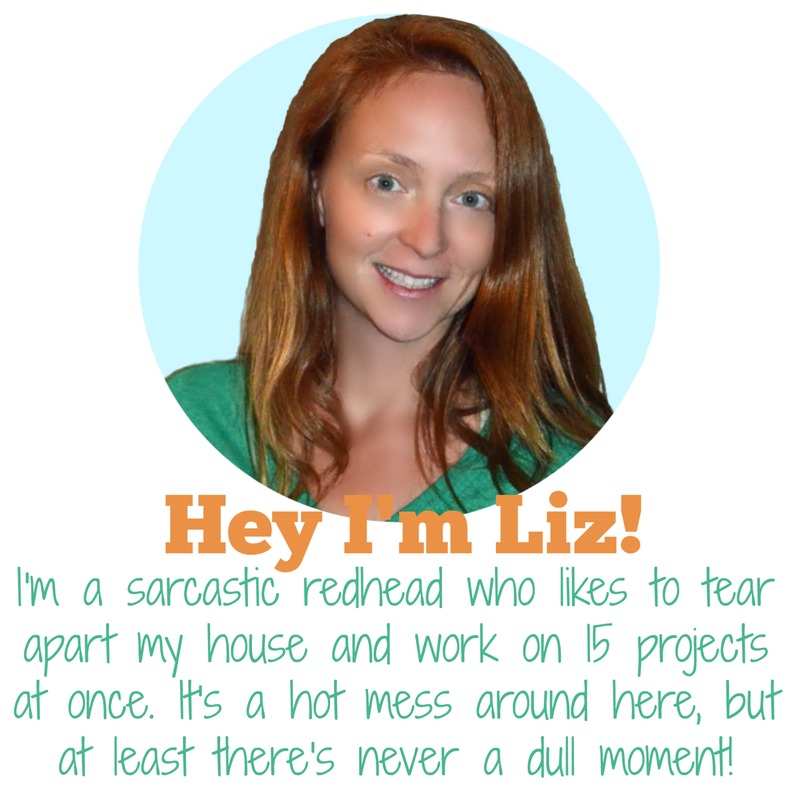 I poked a few holes in the soffit above the refrigerator and found a main HVAC line, so I’m going to live with it. 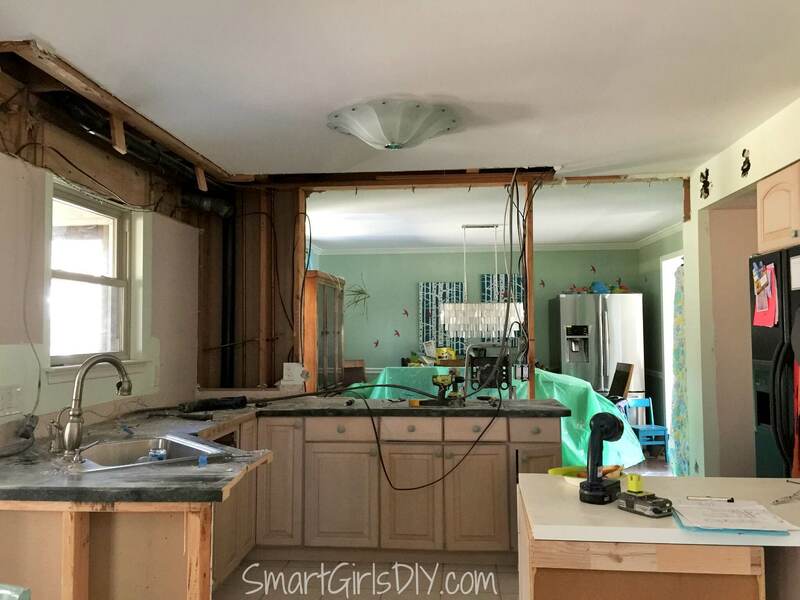 But there was nothing in the wall above the opening to the dining room, so that was definitely coming out. 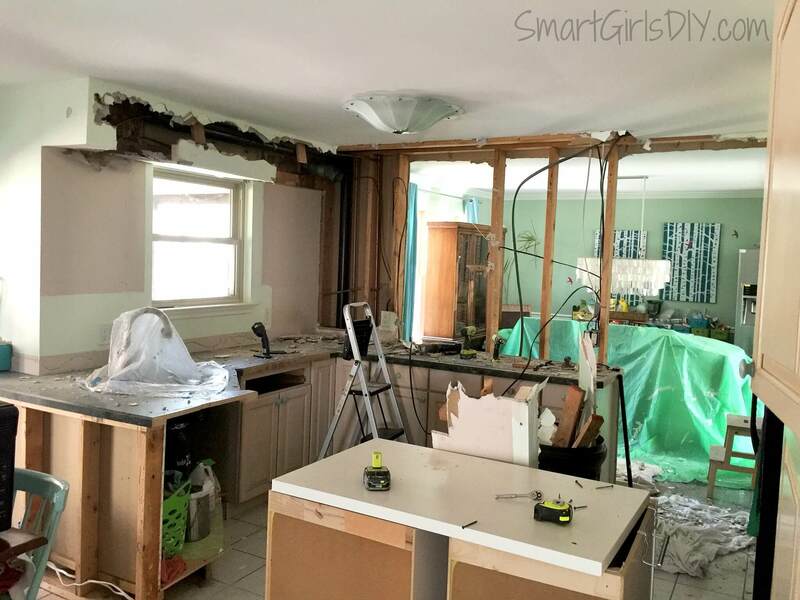 At some point I decided that I could live with a transition from tile in the kitchen to wood in the dining room even if I took down the wall in between. As long as I kept a peninsula on that side (with the range) I was okay with it. I even started a Pinterest board just on floor transitions. 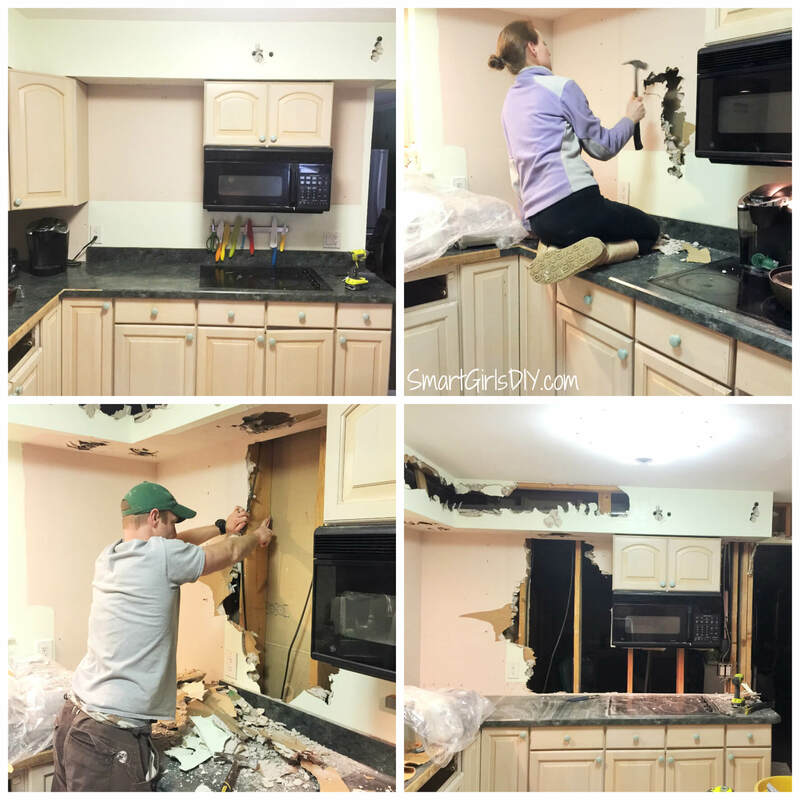 So when hubby got home from work I had already taken all the wall cabinets down, all except the one above the microwave. 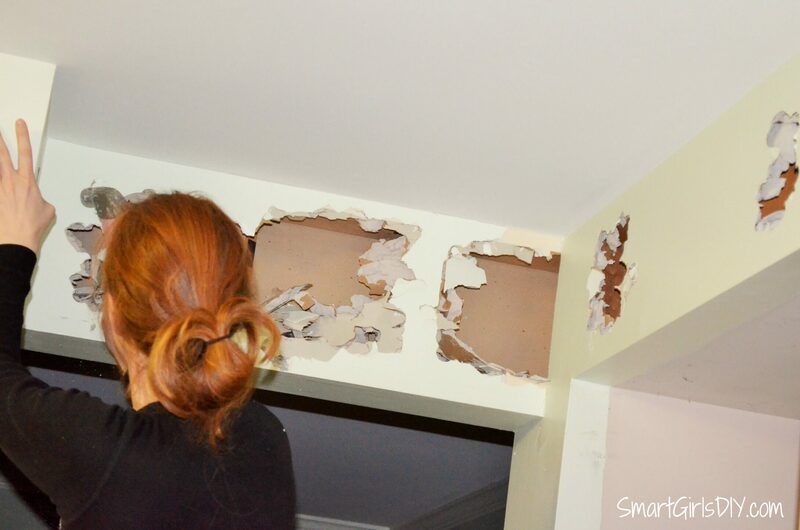 We spent the night before Easter doing a little kitchen demo — removing some drywall. 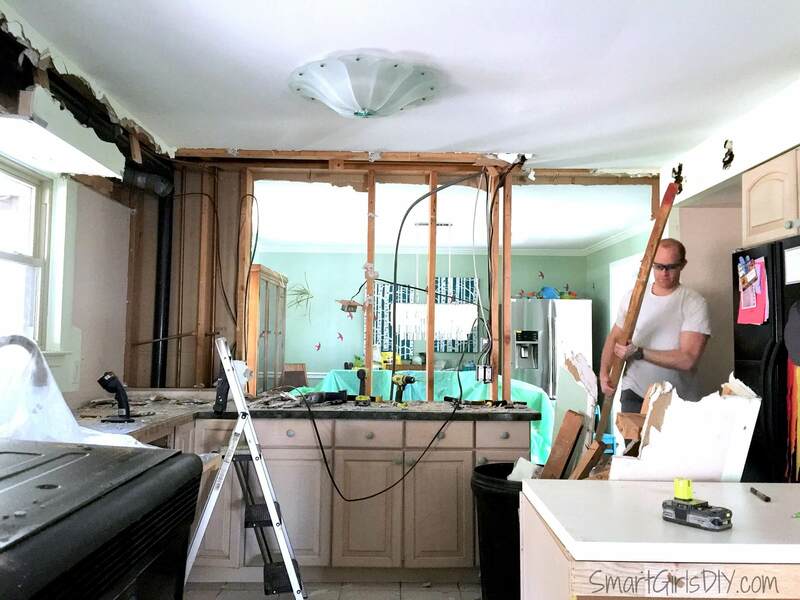 Between church and Easter dinner at my in-laws, we finished up all the kitchen demo we are planning for now. We discovered that not only are there pipes in the wall between the rooms, but also a sewage pipe. Luckily they are only in the first 2 ft of wall space, so the rest of the wall and the soffit came out. The 2×6 stud on the right is only there temporarily because it is holding all the electrical wires in place. The sewage pipe extends behind the soffit on the window wall as well. I’m going to have a plumber give me an estimate to move it, but I am already devising a way to hide the pipe inside a much smaller soffit. I’m not planning to put cabinets on that wall anyway, just open shelving, so I think I can make it work. For now we’re enjoying our new layout. We actually are. The cooktop, wall oven, sink and refrigerator all work. The microwave has been relocated to the back porch, where hubby continues to use it, but it’s on its way to the trash if you ask me. 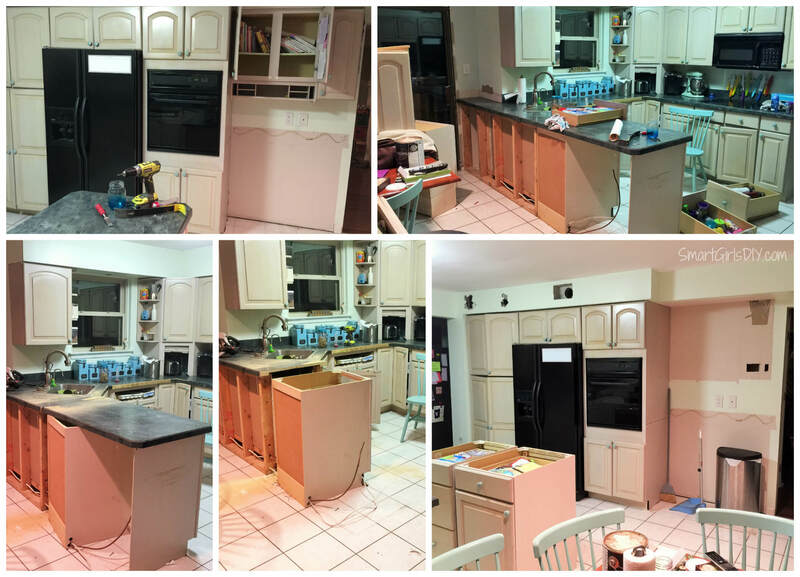 I’ve been working on the kitchen cabinet design, but obviously things keep changing as I do more demo and find new obstacles. The kitchen is feeling bigger already! 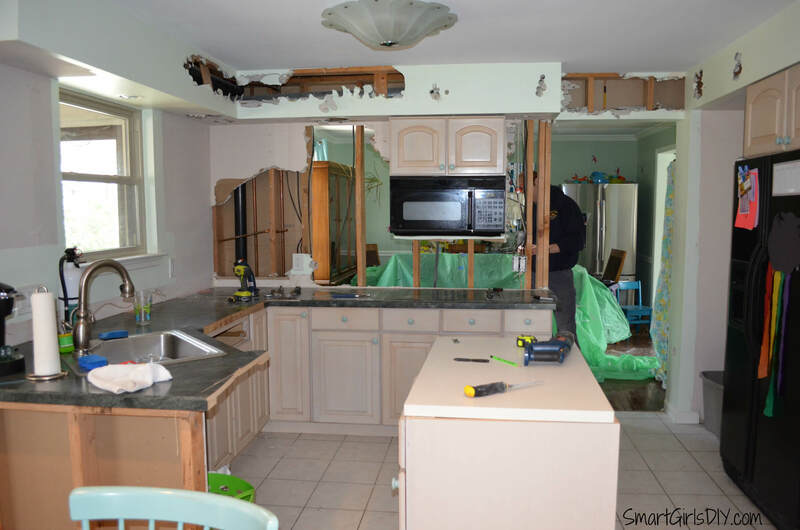 I guess a little kitchen demo will do that. 😉 The ceilings seem soooo high to me now. That soffit was the worst. Things are slow this week because I’ve been hanging out with the kiddos for their spring break. We saw Home today, which was cute. Perfect for a rainy day.